Manchester Orchestra had always prided themselves on their approach. The Atlanta-based band, led by singer/lyricist Andy Hull with Robert McDowell (who is also Hull’s brother-in-law and lifelong friend), had spent their career challenging each other to build a poignant, exhilarating narrative with each new album and EP. The band had worked relentlessly to cultivate a passionate fan base the old-fashioned way: releasing music, making music videos, and touring (most recently with drummer Tim Very and bassist Andy Prince. 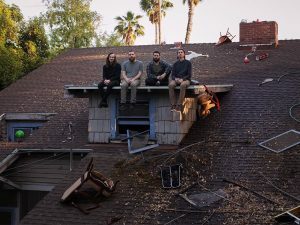 Describing a rock record as “cinematic” usually implies a double-length, sprawling album with a full orchestra on every song; Manchester Orchestra’s most recent release A Black Mile to the Surface is cinematic in that it conjures worlds. There’s magical surrealism at work, with songs about a boy with no ears (“The Alien”) and the father/sleeping child callback of “The Sunshine.” A Black Mile to the Surface is a bold record of vision and purpose, inspired by and dwelling in a sensory and imaginative experience. It’s a reinvention of sorts, both musically and personally—a sort of cosmic worldview shift.